Rain Gardens will be reimbursed at 75% of total costs with a maximum payment of $3,500.00 per parcel per year. When pre-treatment is required, the pre-treatment costs are included in the cost of the practice. A Rain Garden is a shallow landscaped depression that incorporates many pollutant removal mechanisms including temporarily ponding stormwater runoff 6 to 12 inches above a mulch layer that encourages the rain water to infiltrate into the underlying native soil within 48 hours. Rain gardens are an easy and effective tool that we can use to help reduce stormwater runoff from residential properties. These gardens are strategically placed to intercept pollutant laden stormwater runoff until itcan be fully absorbed into the ground. Their design allows the rain garden to serve almost as a bowl that collects water from downspouts or overland flow across a property. The water is then able to slowly infiltrate into the underlying soil. 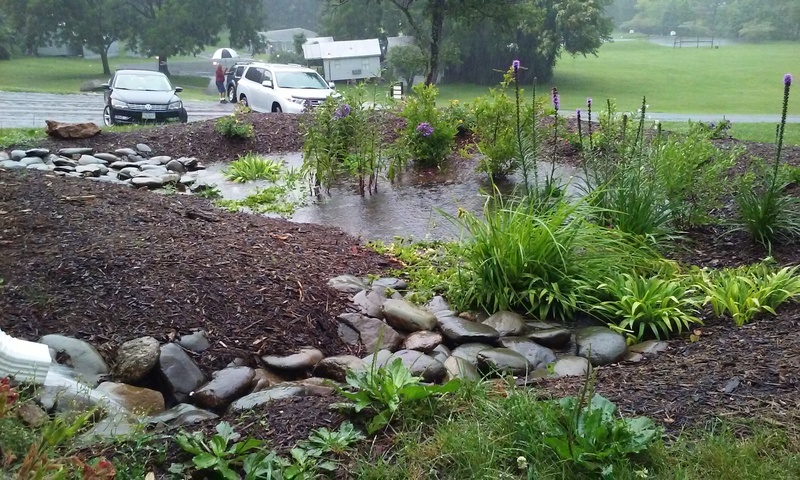 Rain gardens can come in all different shapes and sizes but are best when planted with native plants that are indigenous to the Chesapeake Bay watershed. These plants require little maintenance once established, have deep roots that soak up lots of water, provide food and habitat to wildlife, and are beautiful. Rain Gardens should be designed to treat runoff from small areas, such as individual rooftops, driveways and other on-lot features in single-family detached residential developments. Inflow is typically from a downspout with energy dissipaters or can be sheet flow from a driveway/patio or lawn. This practice is intended for disconnecting impervious surfaces. While both conservation landscaping and rain gardens incorporate similar elements of gardening to promote cleaner air and water, rain gardens are more focused on water drainage while conservation landscaping typically focuses more on visual and wildlife elements.